Hi, Buccaneers fans! Our Tampa Bay Buccaneers are into their 2016 off-season until their training camp begins by late July, but the Tampa Bay Rays will play baseball this Spring and Summer, and also seek to improve from their fourth place, 80-82 record from their 2015 MLB season, and aim to win the American League East in 2016. Spring training begins in Mid-February, when all the players report down the Gulf Coast in Port Charlotte. Rays play the Washington Senators in their first exhibition game on Wednesday afternoon, March 3. Rays later start the long 162-game regular season as they host the Toronto Blue Jays on Sunday afternoon, April 3, at Tropicana Field. NO injuries, and GO RAYS!!!!! Last edited by Plinko on Fri Jan 15, 2016 12:23 am, edited 1 time in total. Passed! The Rays are free to look in both Pinellas and Hillsborough. I know I'm making a belated post but I'm glad this whole ordeal has finally come to an end. I just wish it hadn't taken over 6 calendar years and 2 St. Petersburg mayors. How much more money this is going to cost now as opposed to when we first started talking about getting a new ballpark to begin with? This is gonna be what, at least an extra $50 million because of the scorched earth approach to the subject? The St. Pete taxpayers rejected the new "sailboat" ballpark well before 2010 and then said, "We have a lease. The Trop is just fine. Go look for a place to build in the same city that refused to pay for a less expensive project to begin with." I hope Stu and the boys get to work on it and find a couple of places where they want to build by this time next year. The Rays are one step closer to securing a new ballpark. A very small step, but a step nonetheless. You've got to be kidding me. In the amount of time it has taken to allow the Rays to even consider Tampa as a new we could've built a stadium twice by now. Understatement of the year. Rays sign Steve Pearce to a 1-year deal. So I'm about to renew mine and my grandson's season tix and every year I ask myself, "Why am I doing this?" Losing Price and Zobrist were horrible but KK made up for some of it. However, it's not enough this season. So, I go to the masses - what am I looking forward to seeing this year that I am overlooking. Don't say Longo. That's a given. Here's a flashback to his first season. 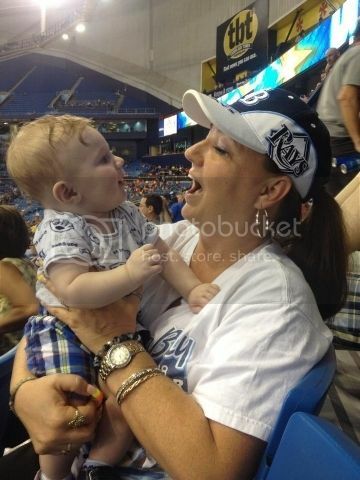 And yes, he's still the youngest Rays season tix holder. you know it's cute. I'm teaching him to cheer in that picture. However, he's more of a hockey fan now. But he's not old enough for hockey games. Or football games. Baseball is safer. I have the same question. As low expectations I had entering last season, I have even lower expectations for this season. I'm not sure what there is to be excited about. We aquired Corey Dickerson for "multiple pitchers". Our OF is ridiculous. Not sure what pitchers yet. Last edited by Teitan on Thu Jan 28, 2016 4:12 pm, edited 1 time in total. According to MLB Network's Joel Sherman, the Tampa Bay Rays have traded reliever Jake McGee to the Colorado Rockies for left fielder Corey Dickerson with some minor league players involved in the deal. pewterpirates wrote: According to MLB Network's Joel Sherman, the Tampa Bay Rays have traded reliever Jake McGee to the Colorado Rockies for left fielder Corey Dickerson with some minor league players involved in the deal. I know, right? I fully expect us to be competing for the 1st overall pick. Everything is just...disappointing. Look at his stats hitting at the Coors Park launching pad versus any other park. Scares me a bit. So I'm looking forward to a sophomore coach and nothing new added. just trading away as much as possible to hit that magical $54million mark. I'm thinking this year I'm buying Lightning tix. At least Vinik spends. And what pisses me off most about our owners is that we get $84M doing NOTHING!!!!!! the ballpark can be empty every day, every week, every month, every year - and THEY STILL GET $84M!!!! Looks like what was drawn up before Vinik got ahold of downtown Tampa and decided to mold it in his image. Is this stadium concept even plausible? 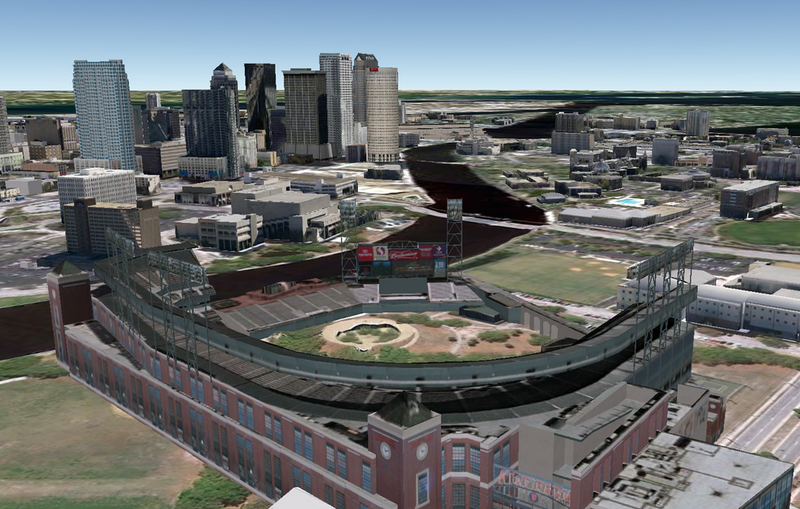 I'm looking at anywhere they can build a new ballpark and the options are pretty much down to nothing. If they find a square space of land to build a stadium, they're gonna have a hell of a time to arrange parking. They're gonna need buses, ferries and a lot of space that needs to be leveled off. I'm glad the Rays are getting a chance in Hillsborough but downtown Tampa seems to be the most ambitious and difficult site. Outdoor would not work here. Would have to be at least retractable. Dickersons numbers outside of the Rockies doesn't scare me. He's still a .300 hitter. Maybe his HRs decline but the guy can hit. I'm excited to see a Keirmier, Souza, Longo, Dickerson line up. Teitan wrote: Outdoor would not work here. Would have to be at least retractable. This. Have you noticed that from May through August it rains every afternoon? I take that back. it's not rain. It's hellatious thunderstorms every afternoon. Right about at game time. If not it's about 98 degrees. Exactly. Doing an outdoor-only stadium would be ill-advised. It needs to be a retractable roof, like the one proposed several years ago. That's the talk here in Texas for the Rangers. Will their next stadium be indoor/retractable? Because going to games in the 100's, especially day games, is brutal. We don't have to worry about the storms that Tampa Bay area gets, but the heat makes games almost unbearable to sit through. I really like the idea of the Marlins park. Even if ours doesn't open up I love the windows letting in the natural light. But can we get a random dolphin sculpture thing? Kress wrote: But can we get a random dolphin sculpture thing? Maybe we can get like a little Raisin Bran sun to pop out after home runs?